In Biology, camouflage is any combination of coloring materials, lighting, body of techniques and methods that allow an organism to conceal its presence and remain undifferentiated in relation to its surroundings. 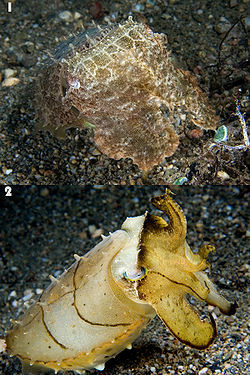 Camouflage can come in two basic forms: the passive, more related to appearance, and active, connected to instinctive behavior. ↑ Simmons, Geoffrey (2007). Billions of Missing Links. Eugene, Oregon: Harvest House Publishers. p. 185. ISBN 978-0-7369-1746-9. This page was last modified on 31 May 2013, at 09:28.